Mass Comm Week kicked off Monday, March 25 with the “First Amendment Free Food Festival,” sponsored by The Alestle, and the St. Louis Professional Chapter of the Society of Professional Journalists (SPJ) and College Media Advisors. Guests could temporarily “sign away their right to freedom of speech” in exchange for free pizza and soda. While the participants ate their free food, they were told exactly what they could and could not say, read and so on. By nullifying this right, the event brought awareness to the principle that allows American citizens the freedom to articulate their opinions and ideas without the fear of retaliation or legal sanction. Additionally, a panel of mass communications alumni, including Nick Barth, David Bracey, Monica Buschor, Caitlin Lally, and Amanda Juenger, returned to campus to share what they wish they had known before they graduated. The alumni gave the students advice about their futures, tips for pursuing jobs and applying for internships, as well as shared how they have navigated through the transformative period in their lives after college. SIUE Athletics’ Joe Pott, broadcaster and media relations specialist, shared his personal journey into the world of sports media. Pott has broadcast more than 1,000 basketball, baseball, soccer, softball and volleyball games as the voice of the SIUE Cougars. Before joining the University, he served in a multifaceted communications position for the Gateway Grizzlies professional baseball team. His responsibilities included broadcasting games, writing and voicing radio promos, managing web content and producing feature news stories. “I was always fascinated by the medium of radio,” Pott said. “I loved sports, and I knew I wanted to have a career in sports. During my freshman year, I was a business student, and I took a job open to all majors at my college’s radio station, FlyerRadio. The station began broadcasting play-by-play for a minor league hockey team, and I realized I should be up in a booth, broadcasting games. The Department of Mass Communications also invited one of its own graduate students to share their expertise. Elizabeth Donald, teaching assistant, freelance journalist, and president of the St. Louis SPJ, shared a captivating lecture on the importance of ethics in journalism. With more than 20 years of reporting experience, Donald has received multiple awards for her journalism and fiction writing. 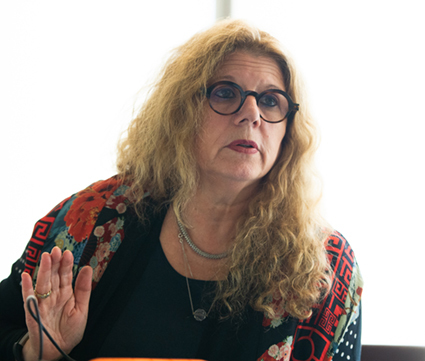 She also served on the SPJ’s national ethics commission to rewrite the group’s Code of Ethics in 2014. Donald outlined the SPJ’s Code of Ethics’ four principles that serve as the foundation of ethical journalism. 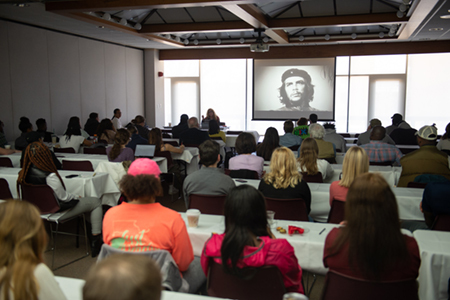 Photos: SIUE’s Mass Comm Week concluded with a keynote address by Trisha Ziff.